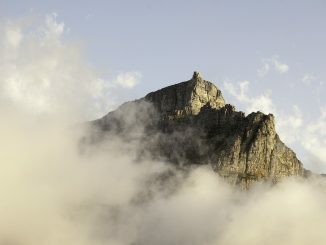 The Krakadouw peaks as seen from Three Stones on the Clanwilliam side of the Krakadouw Pass. 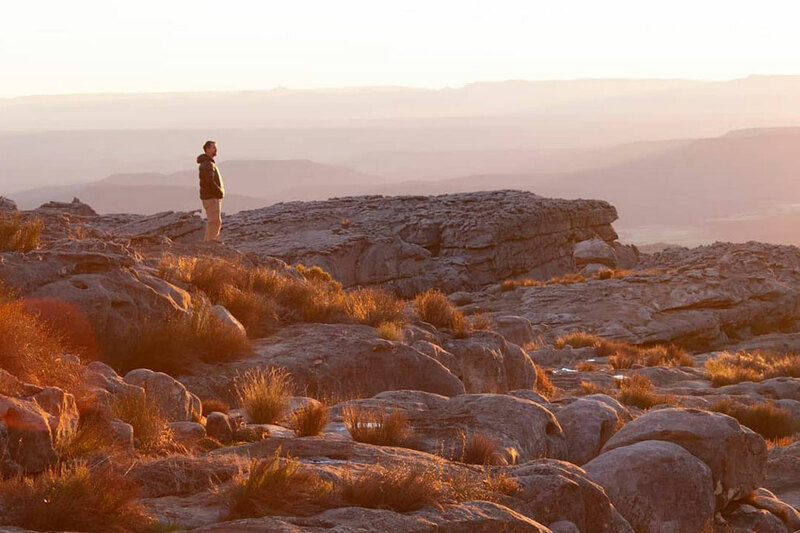 If you’re into peak-bagging, the Cederberg offers a host of options. 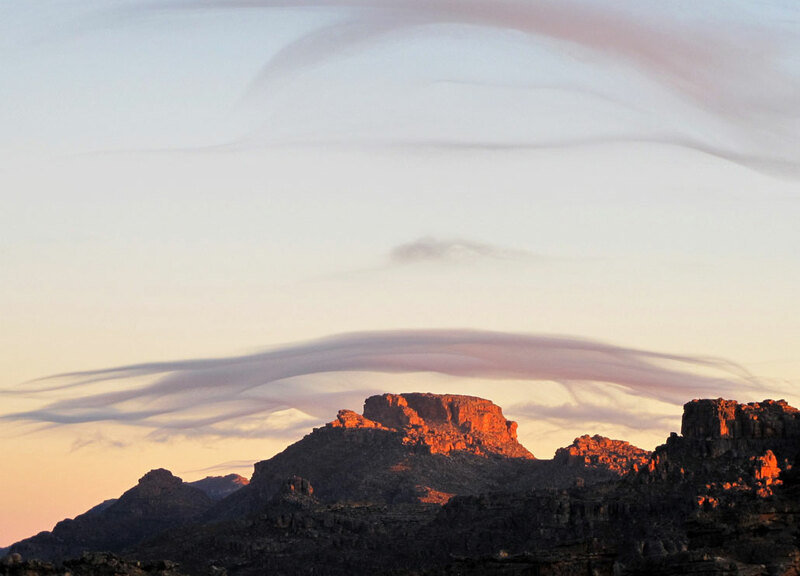 What makes some of these peaks remarkable is that, in addition to the fantastic summit views, they also offer scenic walk-ins and a wonderworld of rock features that can be explored. 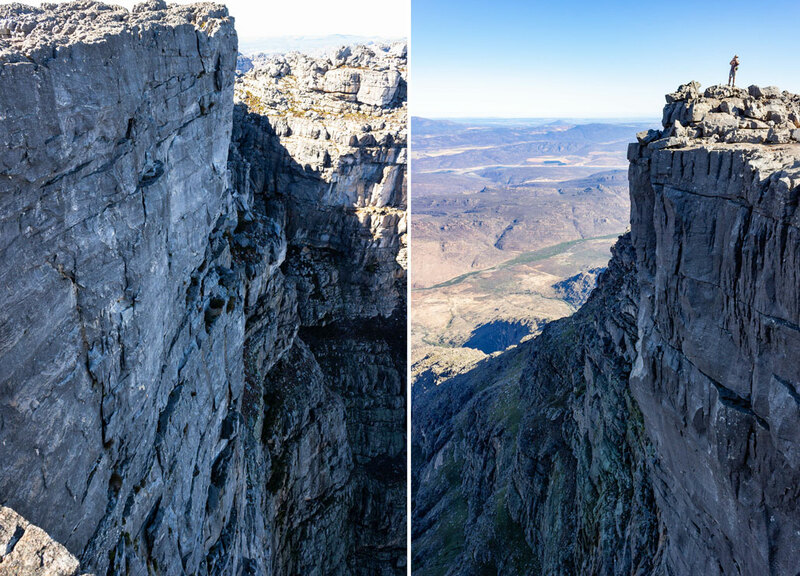 These are my top four Cederberg peaks. Not a peak in the classic sense, but Wolfberg is definitely conspicuous with its 150m high, sheer, red sandstone cliffs looming over the Sand River Valley. Within this rock massif there is a wonderworld of geological features that look like they came straight out of an Indiana Jones-type movie. 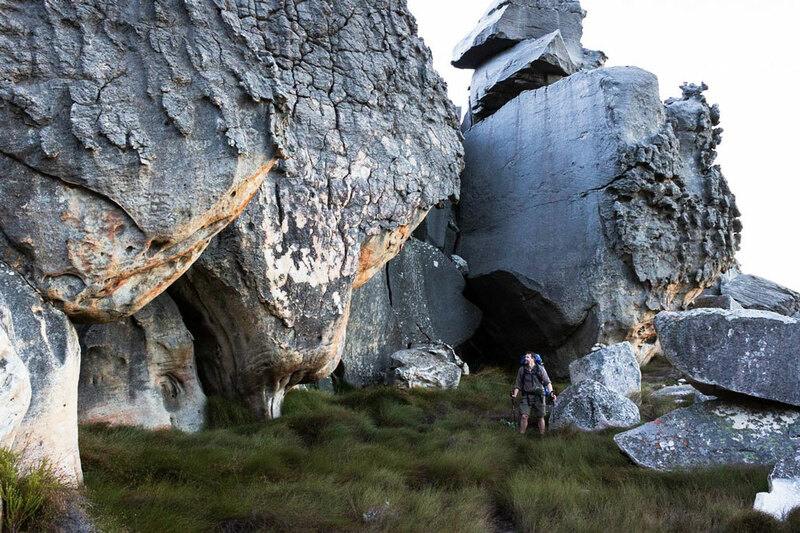 So, if you ever find yourself in the vicinity, do not pass up the opportunity to explore the Wolfberg Narrow Crack with its crawls, scrambles and mind-boggling rock formations. It is highly recommended! The path up to Wolfberg starts at a parking area, about 2km from the Sanddrif campsite. One has to obtain a permit from the Cederberg Wines office, as well as the code for the gate to access the parking area. From the carpark there is a clear and well-marked path up to Wolfberg. It is a committing walk with some 350m of vertical ascent to the base of the cliffs, but the path is well constructed and does not pose any technical difficulties – that is until you enter the cracks, where the terrain is much more challenging and interesting! The best direction to go through the Narrow Crack is from bottom to top. Shortly before the main trail enters the Large Crack, there is a path splitting off to the right (keep an eye out for cairns). The trail takes you to a short scramble (which should not be underestimated in its difficulty!) or a crawl through some boulders to gain a ledge. Follow the ledge southward until you can turn and go left, facing the impressive Leaning Tower. From there the entrance to the Narrow Crack is obvious. The crack hosts many spectacular rock features, including rock arches and a natural stone bridge (aka the bridge of Khazad Dûm). 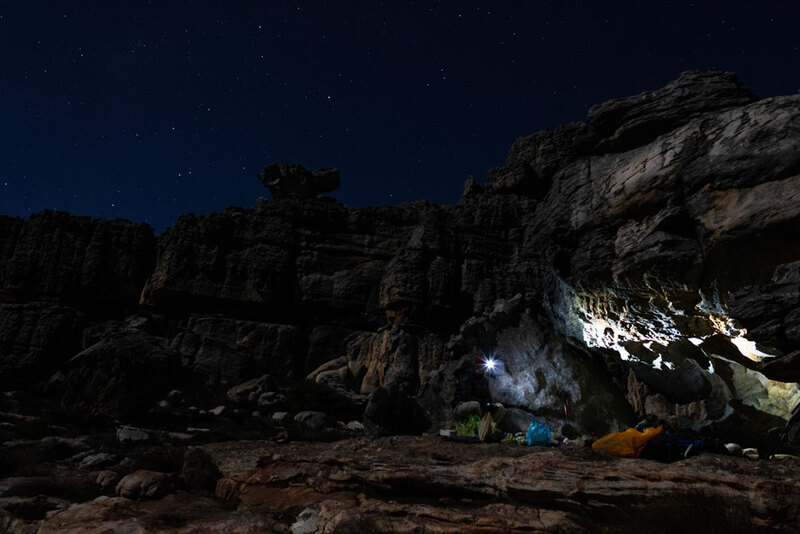 There is a crawl-through section, underneath a wedged boulder, through almost pitch-black darkness, and another steep, technical scramble near the end. None of the scrambles are high enough to pose a serious safety risk though, but do take care. 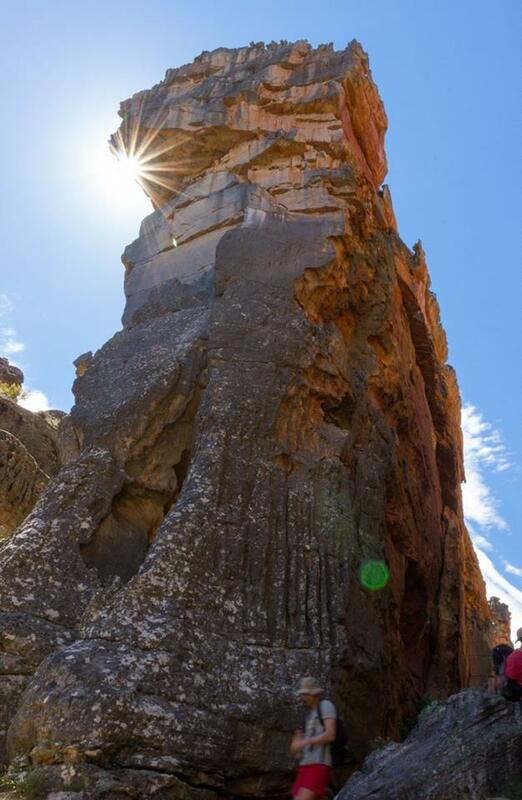 It is recommended to go back via the Large Crack – a much easier walk down with some spectacular features of its own. The Knobless Robot standing proud in the Large Crack. 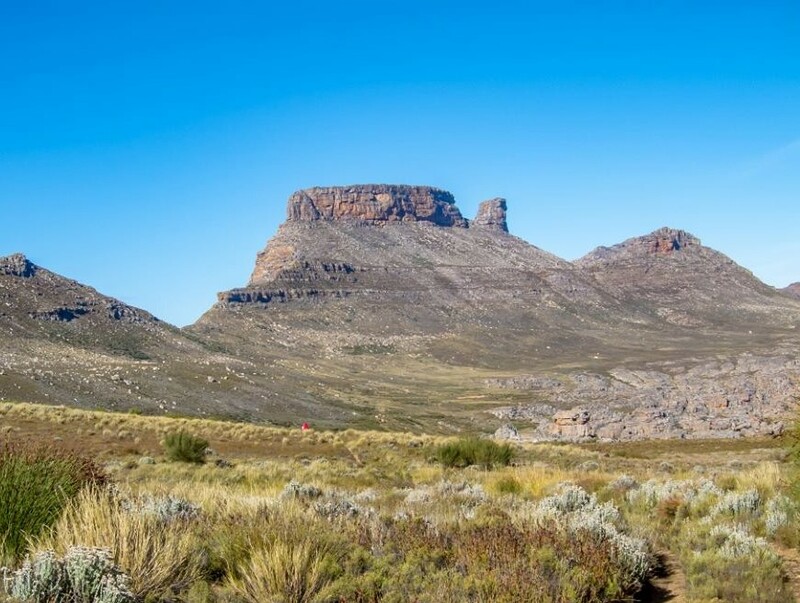 When crossing Uitkyk Pass, into the Driehoeks and Sand River Valley, one cannot but notice the impressive flat-topped and sheer-sided Tafelberg, perched on a rising slope, high above the surrounding peaks to the north. 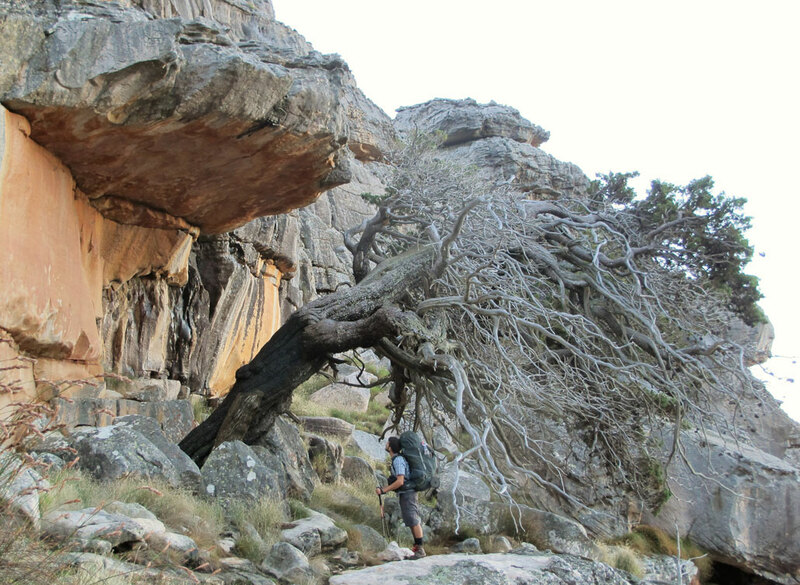 Tafelberg is most easily accessed from Driehoek, from where the trail going up Welbedacht Kloof to Welbedacht Cave starts from a parking area underneath a cluster of oak trees next to the Driehoeks River. 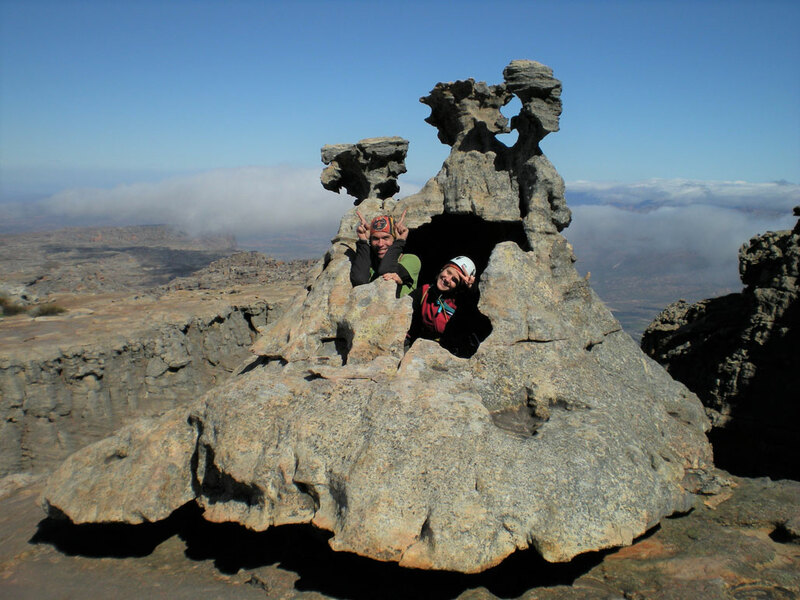 As part of a multi-day hike, it can also be accessed from Crystal Pools/Sleeppad Hut or Wolfberg/Sanddrif. 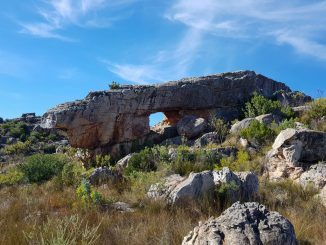 For weekend trips, it is worthwhile to try and get to Welbedacht Cave the evening of your arrival, as it halves the 6.5km walk-in. 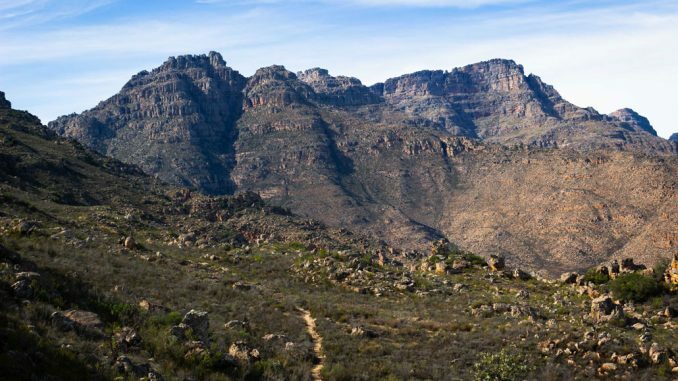 The trail to Welbedacht Cave is clear and easy to follow in low light – a hard but pleasant walk of approximately 3.5km with 450m elevation gain. Starting the hike up Welbedacht Kloof. Proper hiking shoes are recommended! 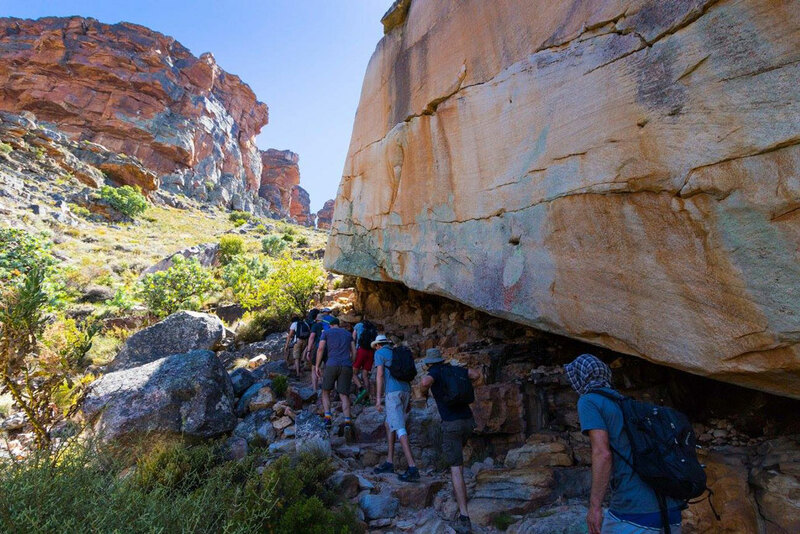 Getting to Spout Cave from Welbedacht Cave requires a further 3km of walking with 500m elevation gain. 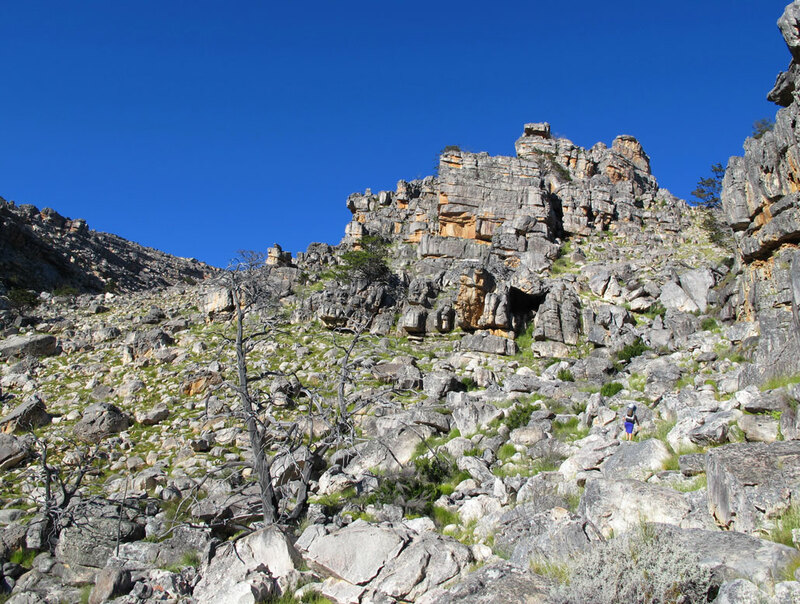 The trail to Spout Cave turns left off the jeep track, approximately 800m down from the top of Welbedacht Kloof (take note that there is a trail from Welbedacht Cave that takes one to the jeep track approximately 300m from the turn-off towards Spout Cave). The trail heads up the slopes to the north-west of Consolation Peak, before crossing the small plain below Tafelberg proper and then heading up again. Take care on the second half of this trail, which requires one to navigate a boulder field up the steep slopes. 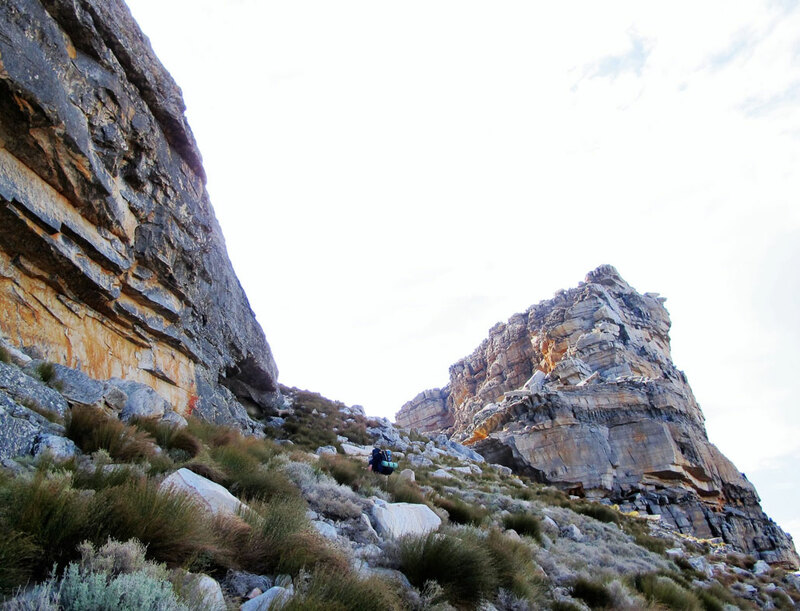 The final push – approaching Spout Cave in the gap between Tafelberg and Spout. 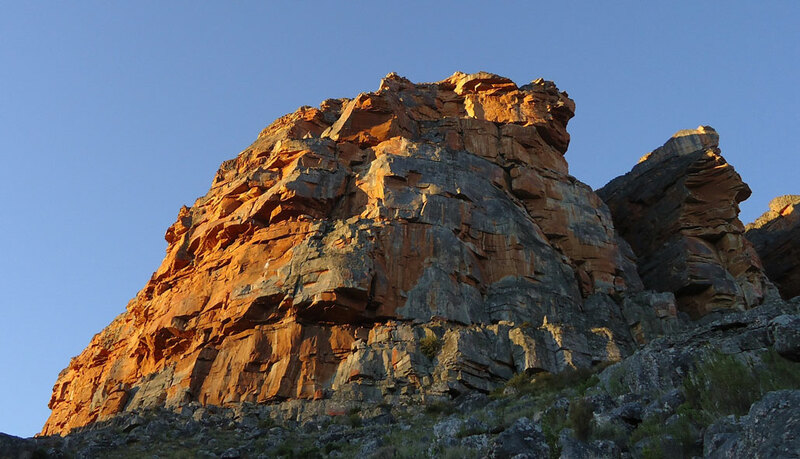 Tafelberg is a flat-topped sandstone monolith approximately 700m long with 150-200m high cliffs – a rock climber’s paradise. Perched high above the surrounding valleys, it offers a rare quality of solitude and incredible views. 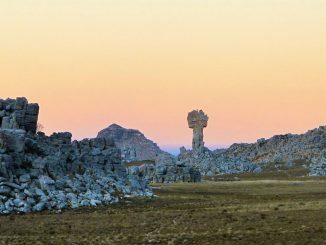 The top of Tafelberg is a surreal, moon-like landscape with crazy rock formations, sculpted by millennia of unobstructed pummeling by the elements. 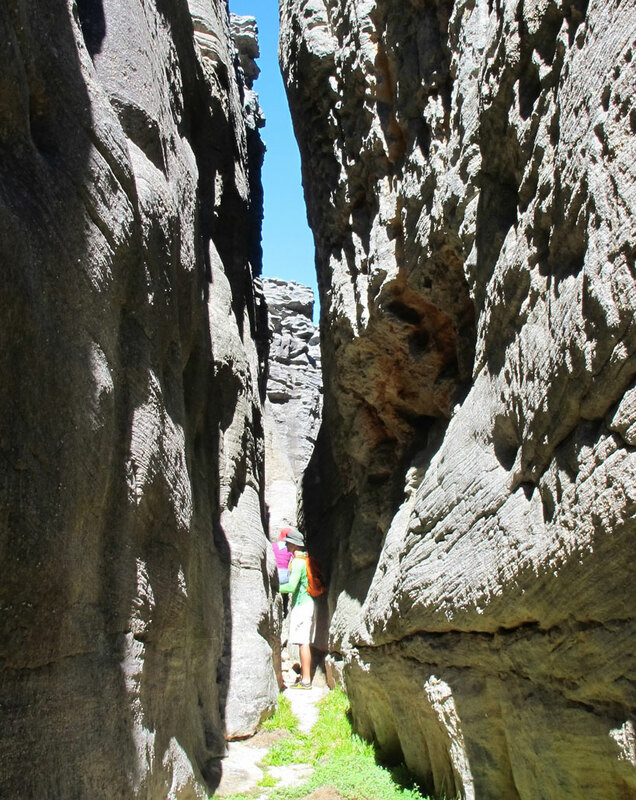 It is accessed via a gully on the eastern side which has a fixed chain in place for the final, steep scramble. The flat “sundowners deck” at Spout Cave is as spectacular a spot as one can find to enjoy sunset views. A truly memorable place to visit. There is no water at Spout cave, and one has to either carry water up from the streams springing from the plain behind Consolation Peak, or find the seasonal drip at the back of the Spout (between January and April the nearest water may be in Welbedacht Kloof). A small pond has been built to accumulate water from the drip, but please use the water sparingly and keep it religiously clean as it is the only water source for the climbers who stay at Spout Cave for multiple days. 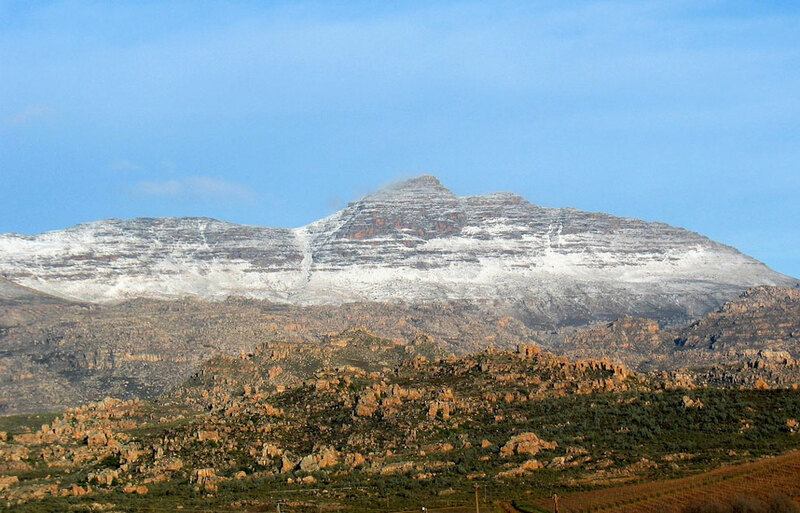 Sneeuberg is the highest peak in the Cederberg at 2027m, and towers approximately 700m above the plain on which the Maltese Cross and Sneeuberg Hut rests. On a clear day, one can see Table Mountain from the summit, 170km away. 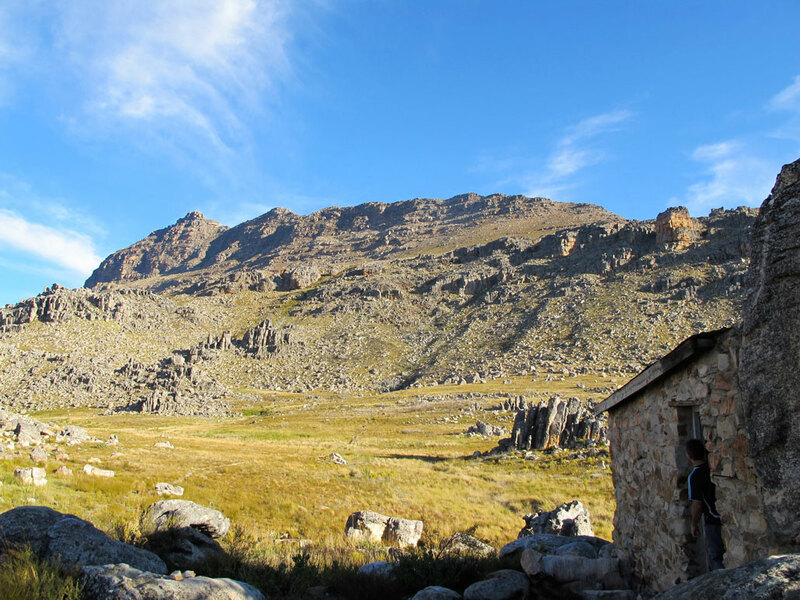 Sneeuberg Hut is the ideal base from which to embark on the summit-walk, and as there is no camping on the peak itself it is best done in a single day. 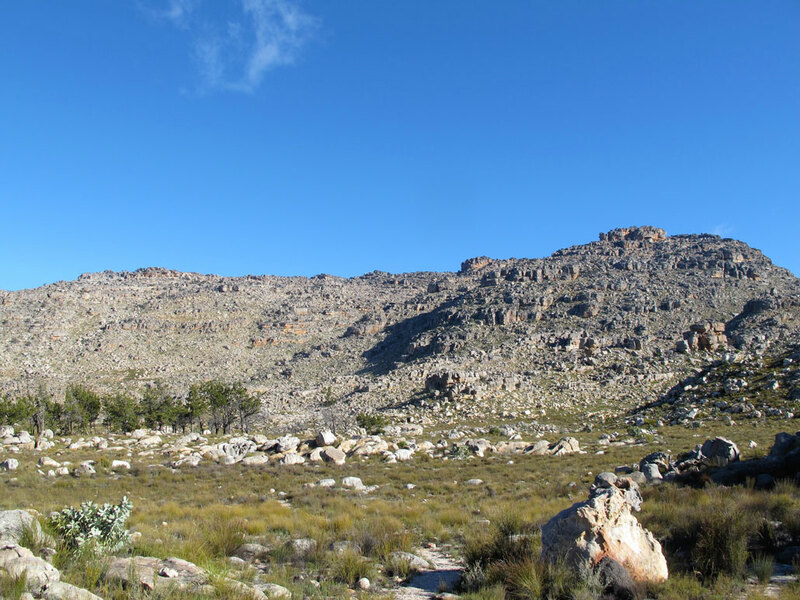 Sneeuberg Hut’s shortest access route is from the parking area next to the main road, more or less in-line with the Driehoek campsite (see the Slingsby “Hike the Cederberg” map). From there it is a 6.3km walk up Sederhout Kloof (440m elevation gain) to Sneeuberg Hut. 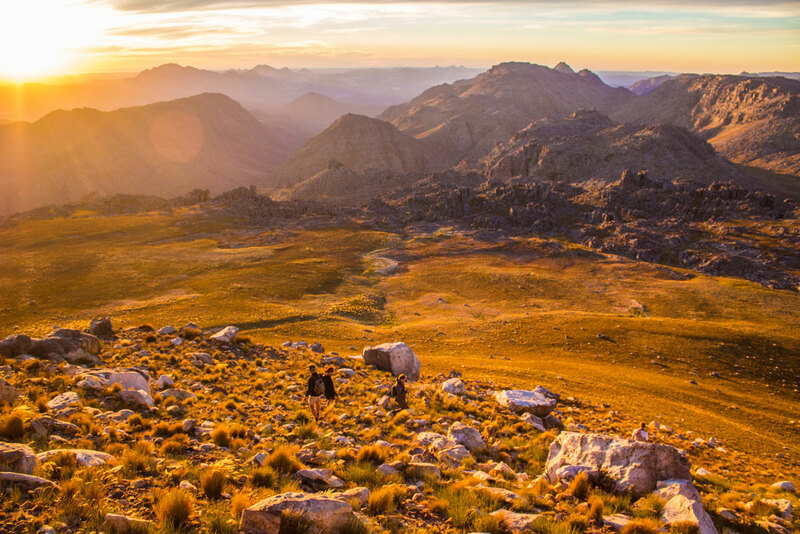 As part of a multi-day hike it can also be accessed from the Sanddrif/Maltese cross side, or from Algeria/Uitkyk Pass via the Klein Duiwelsgat trail. 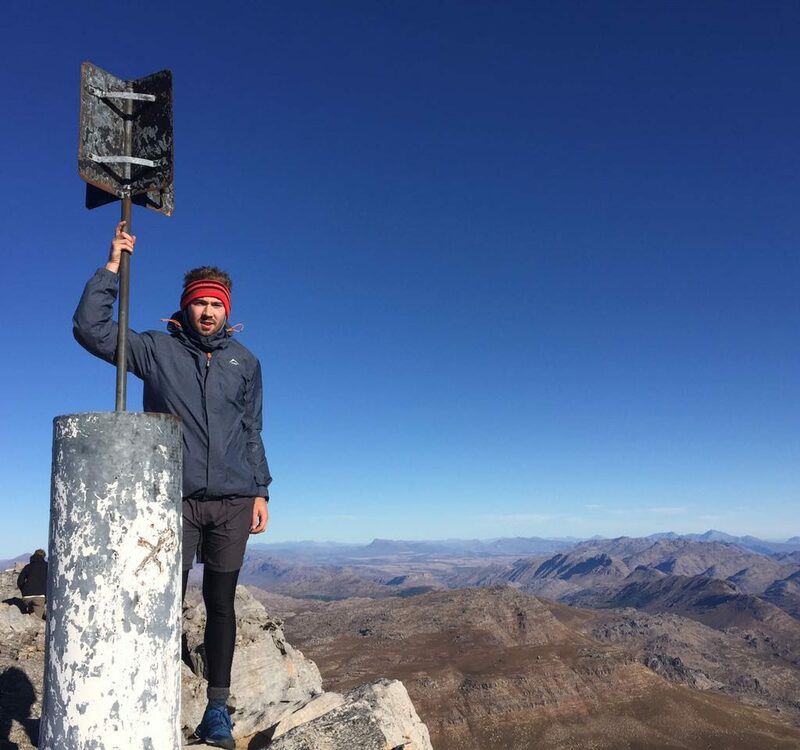 From Sneeuwberg Hut, you have to follow the trail towards the Maltese cross for approximately 3km until you find the path that leads to the summit. Keep an eye out for cairns and signs of the trail, and take care to not follow the old path (see map for details). The trail leads up an indent in the mountain side, and at its pinnacle it breaks to the right to follow the ridge to the summit. To reach the summit will require some scrambling. Be careful not to embark on dangerous terrain if unprepared for it; rather stop short and stay alive – the views are just as breath taking! 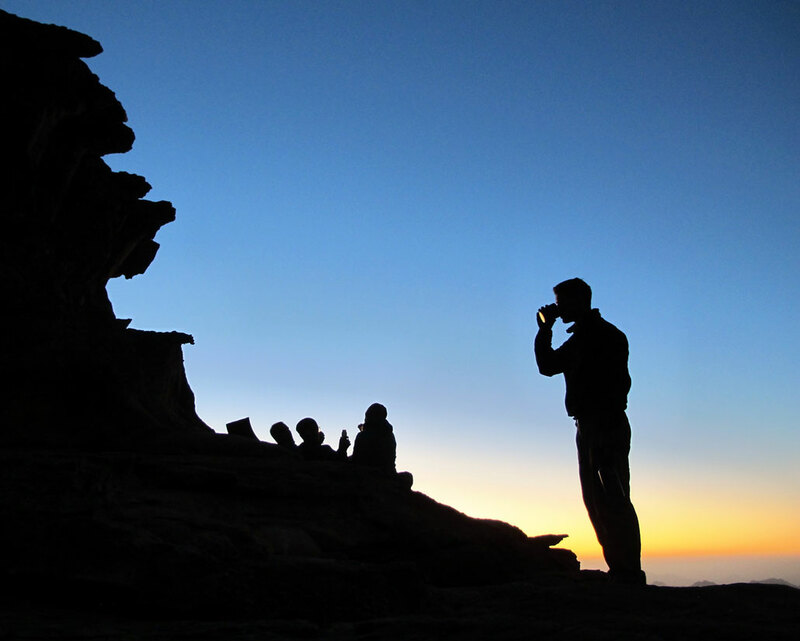 There’s not much that one can compare to the super-sized, otherworldly landscape on Krakadouw peak. It’s no less accessible than Sneeuberg or Tafelberg, but somehow feels more remote and adventurous. The sheer side of the mountain looms over Clanwilliam Dam, but the peak is accessed from the “friendlier” back-side via Heuningvlei Hut. 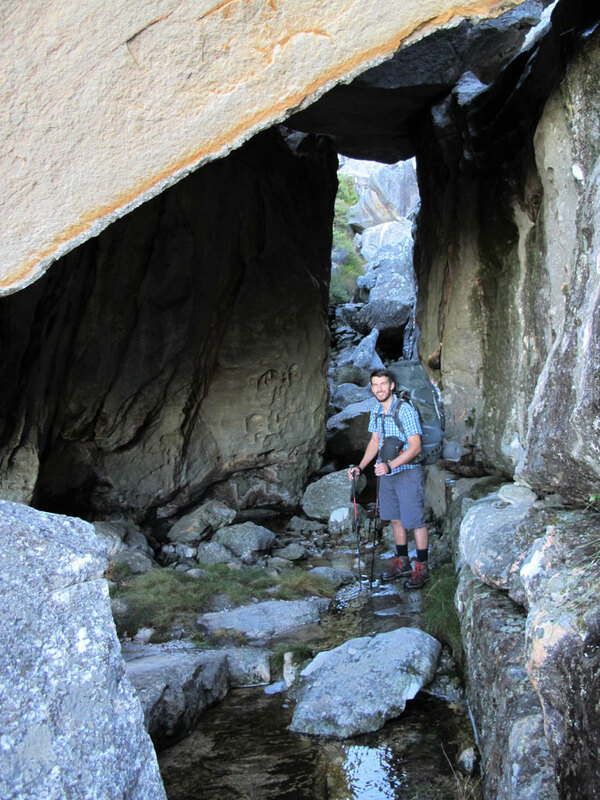 The hut is most easily reached from the hamlet of Heuningvlei – a small settlement seemingly lost in time – from which it is an easy 2km walk to get to the hut. If you leave your vehicle in Heuningvlei, it is best to enquire from the locals where you can park it, which will probably be at somebody’s house for which a nominal fee will be “charged”. The parking area outside the village is unfortunately not safe. Alternatively, Heuningvlei Hut can be reached from Rocklands/Kliphuis campsite via the famous donkey-cart track (approx. 16km), but that will add a (scenic) day or two to your excursion. The boulder-strewn slopes of Krakadouw as seen from the Heuningvlei side. 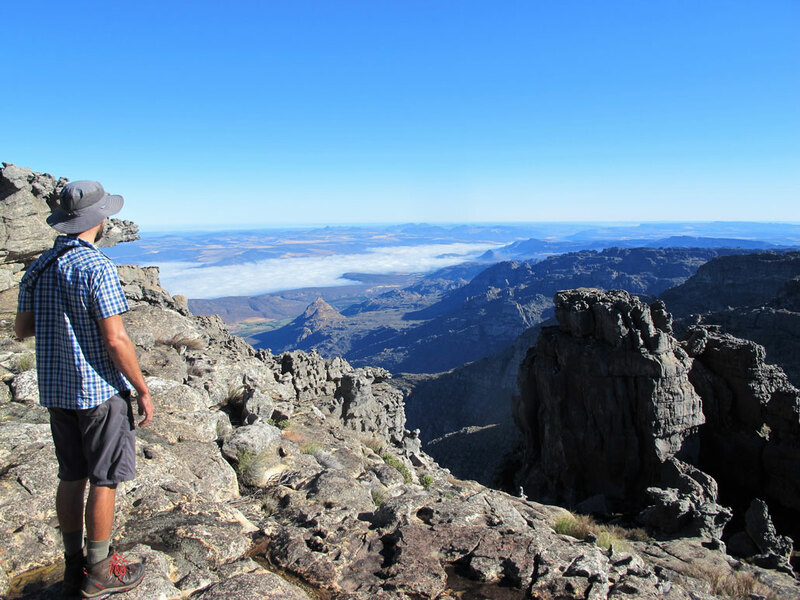 From Heuningvlei Hut there is 4.6km of trail, boulder-hopping and mini-scrambles, with near 800m ascent to reach the peak. This is not an endeavor for novices. 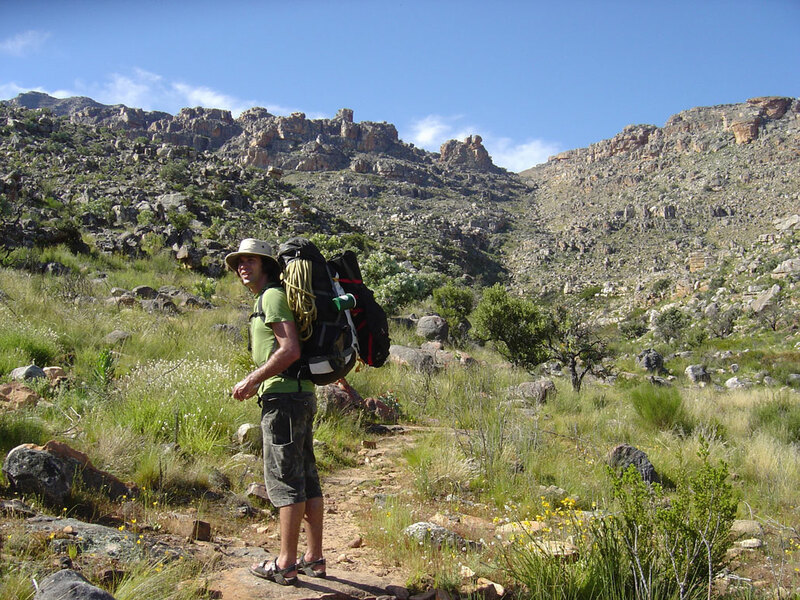 The trail ambles up for approximately 1km past Halfvelskop, from where one has to keep left at the split (the right-hand trail going up to Middle-Krakadouw), and then cross the plains at Moedersielshoek. You will walk past some beautiful Cedar groves before the trail finds its way up the mountain, keeping to the right of a gully with a clear stream and many fallen Cedars. The trail is initially easy to follow, but as the terrain becomes steeper and rockier, the path fades and one must follow cairns. The path keeps to the right of the gully, with one or two places where hikers unfortunately built cairns deviating from the path, but as long as you are going up alongside the gully you are on the right “track”. Near the top, the path crosses the stream, from where it makes some twists and turns to find a way through the maze of oversized boulders and steep gulleys. The mountain flattens near the top, and there are multiple places to camp on the flat rock beds underneath large boulders, in grassy gulleys or the impressive Krakadouw Summit Cave. Camping under rock and stars. 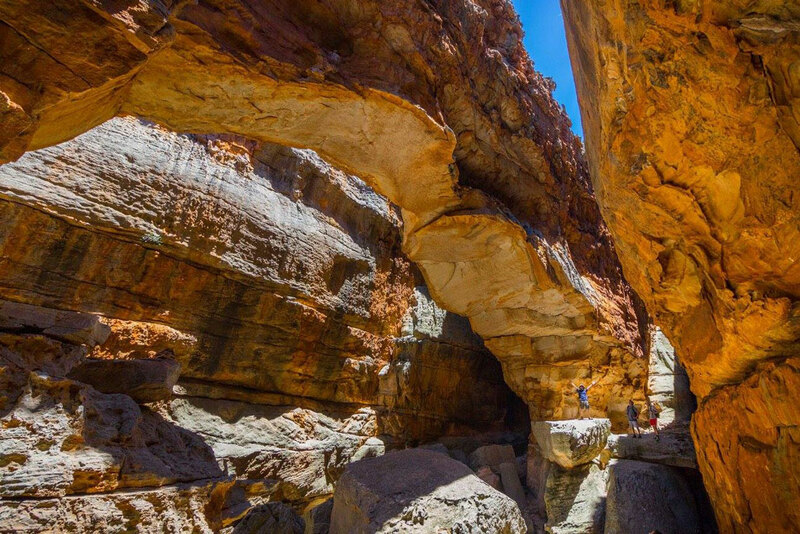 One can easily spend a day exploring the moonscape at the top, with its deep chasms (one named “Long Street”), crazy rock formations and the dizzying drops of the southern and western amphitheaters. 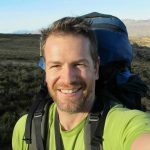 It is recommended that you mark your camping spot on a GPS device when you go exploring – it is easy to lose your way while scrambling around in the narrow gulleys and rock mazes. Early morning bliss as the first sun rays paint the world in rose and golden hues.